Enrique and Gabby Garcia watch investigators at the scene. AT LEAST 26 people have died following the mass shooting at a church in a small town in Texas. The age of victims ranged from five to 72, authorities have said. Among the dead was 14-year-old Annabelle Renee Pomeroy, the daughter of the pastor of the Sutherland Springs church Frank Pomeroy. Frank’s wife Sherri said in a text message that she lost her daughter “and many friends”. Sherri Pomeroy said both she and her husband were out of town and trying to get back to Sutherland Springs. Nick Uhlig tells The Associated Press that his cousin Crystal Holcombe and her in-laws Karla and Bryan Holcombe died in Sunday’s attack at the First Baptist Church in Sutherland Springs. Crystal Holcombe was eight months pregnant. Uhlig says Bryan Holcombe did prison ministry, adding that he would go to the prison with a ukulele and sing for the inmates. A congregant who wasn’t at a Texas church when Devin Kelley opened fire, meanwhile, said his pregnant cousin and her in-laws were among those killed. 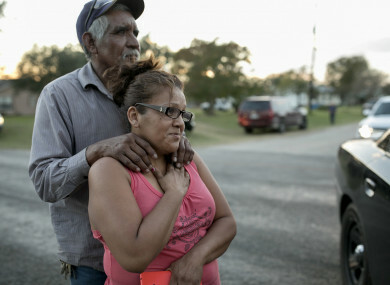 Authorities and parishioners have said that the layout of the church would have made it very difficult for anyone to escape once the shooting started. Sixteen-year-old Hunter Green was at a vigil near the First Baptist Church in Sutherland Springs yesterday evening. He described the church as having only small exits on the side and in the back. If a gunman came in the front door, Green said “they wouldn’t have had anywhere to go”. Email “'A very special, beautiful child': First victims of Texas church massacre named”. Feedback on “'A very special, beautiful child': First victims of Texas church massacre named”.